The reactions to Rhyd Wildermuth’s post on Paganism and the New Right have been incredible and disturbing. Essentially, Rhyd wrote about the influences of racist and ethnocentric ideologies on various traditions of Paganism. It was brave and it was necessary. Extremely important stuff. And Paganism/polytheism have exploded at him and his allies. And not just that, but Rhyd is saying some things that I consider to be *very clearly* a problem in Paganism, and that I have believed for quite some time. So I had no idea people would react quite so negatively. I suppose I should have realised that not everyone in Paganism shares these radical views. But it’s so easy to create Paganism in your own image. To believe that it’s what you want it to be. Only, it’s not. The reactions to Rhyd’s post, and his co-founder Alley Valkyrie’s support of it, make that clear. I think I am most upset by the idea, shared in response to the post, that the *gods* demand new right and racist ideologies. And that without these ideologies we cannot be devotional polytheists. What a way to wheedle out of responsibility for your own behaviour. “The gods told me to.” Only following orders? I am a devotional polytheist. I am a social and political radical. My gods and my radicalism are so closely intertwined that they are inseparable. You cannot divide the threads without pulling apart the tapestry. It is not possible to be neutral, to be apolitical. It is only possible to pretend that you are not political. And the less you understand the ways in which you are political, the ways in which ideology controls your behaviour, the more your hidden politicism can be used against you. Your life, too, is inseparable from your politics and ideologies. Including your ideas about race, ancestry, genetics, culture, the land, the country, empires, colonialism. Maybe you just can’t see where the threads of these things are determining your behaviour towards others. But they always do. There is no such thing as neutral. Decide where you stand. 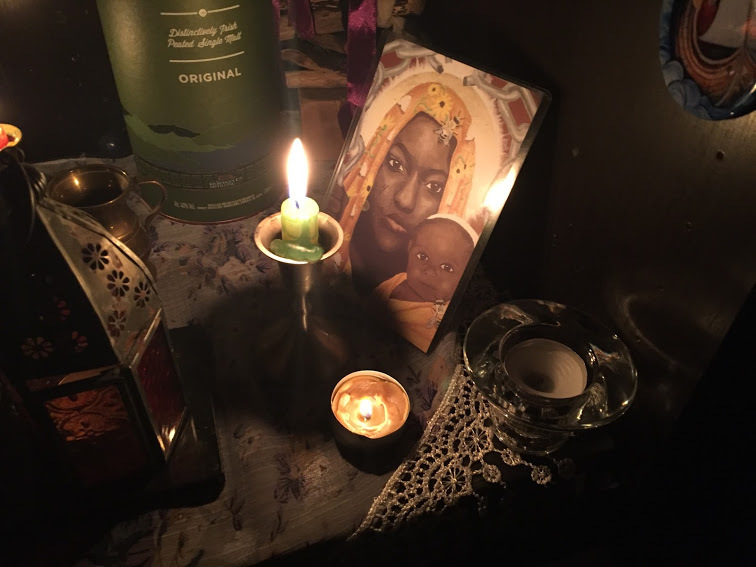 I have stood in all-white Pagan gatherings and despaired that no one else seems to notice the lack of representation of people of colour, nor seems to care that their nativist ideologies are keeping away Pagans of colour. I have sighed as the Pagan message board where I post has been inundated with people saying that they believe they can only worship the ‘Celtic’ gods because their ancestors were ‘mostly Irish and Welsh’ a very long time ago. I have screamed internally as people said ‘Africans’ should worship ‘their own gods’ and should not come to druid gatherings. I have walked out of meetings where a speaker talks about ‘Celtic values’ like being physically perfect (and probably white) and the importance of this to ‘the gods’. But I have not spoken out enough. It’s time for me to stop being so quiet about these things. Silence is complicity. Don’t you dare tell ‘Gods & Radicals’ that it should lose the moniker ‘gods’ because it’s ‘not polytheist enough’. Our polytheism is inseparable from our politics. Mine is inseparable from my radicalism. I cannot have one without the other. I essentially left Christianity because its god did not demand enough radicalism from me. I refuse to listen to another group of people telling me what my gods should or should not ask for me. Didn’t a lot of us already leave a religion that told us what to do, and what values to hold, because we disagreed with those actions and values? Can we really drift into another religion or tradition that does the same? My Lady Bhearra asks for my total commitment to social justice, to the light that flickers in the chaos of human society. That is my reason for writing on a site that is aptly named ‘Gods and Radicals’. My radicalism is polytheist. Let ‘Pagandom’ dare to tell me otherwise. I would never again follow a deity who asked any less than that. Who asked me to compromise my own values and principles. Who asked me to put myself before others. Who asked me to be silent in the face of racism, neocolonialism and right-wing politics. I remain a member of ADF (my membership has accidentally lapsed, actually), though I am giving this some thought. My first thought on being confronted face-to-face with ideologies ADF is influenced by, was not to be offended, but to start thinking. I can’t even claim I never realised this stuff before. I’ve just never confronted it so directly. I need to consider whether I can continue to stand with ADF and with reconstructionist polytheism more widely. This will probably involve shadow work, deep work with my goddess, and real, practical thought about social justice. I left OBOD, rather publicly, because I considered its policies disablist. That was something that directly affected me, and was easy to stand against, as a result. What about ideologies where I have the privilege and others do not? Am I truly committed to social justice if I remain silent on these things? Maybe there are no groups I can be a member of anymore. Maybe that’s OK. Right now I feel like am always likely to be a polytheist with reconstructionist tendencies. But maybe I should allow my goddess of Chaos to tear even that down and make me start again. Any ideology I hold should be held onto lightly, whether it is religious, political or something else. I stand alone on the seashore, between land, sea and sky, and the gods call me to be better than my ancestors. Am I strong enough to answer this call? I don’t know. But I can try. I stand with Gods and Radicals. I stand with Rhyd Wildermuth and Alley Valkyrie. I am a polytheist. I am a radical. I am a social justice druid. Go on, tell me I’m not allowed to do or be any one of these things. Great gods of justice stand with me. And Truth will out. Social Justice Druid t-shirts. I need dis. And everyone should read Kavita Maya‘s research on racism in Paganism, specifically the Goddess movement. She is a great thinker who is much needed by modern Paganism. 31 Days of Offerings – Day 16: Something For Nothing? I have been praying to St Cajetan on behalf of a friend. Novenas (nine-day prayers) to saints are something I’ve been doing for many years. I’ve long since moved past the theology of it, past wondering whether my prayers will be heard, or asking why they would be. I do know that the offering is a bit of a struggle. Half way through the second ‘Our Father’ I’m usually getting a bit bored. By the third ‘Glory Be’ I’ve either started heading towards mystical union with the divine, or I’ve fallen asleep. It varies. I give that you may give. Asking something for nothing is not good for community, or for me. The offering I give in exchange for the saint’s favour may be words, perseverence, steadfastly remembering a friend, or candlelight… I’m not sure where the offering to the saint starts and the gift to the friend begins. And all of that pales when I start to realise that the shaping of my own character is the greatest gift, and I’m giving it to myself. The kindness of strangers can make all the difference. Mostly, to people you’ll never know it’s made a difference to.